Ceramic with creamy white glaze. 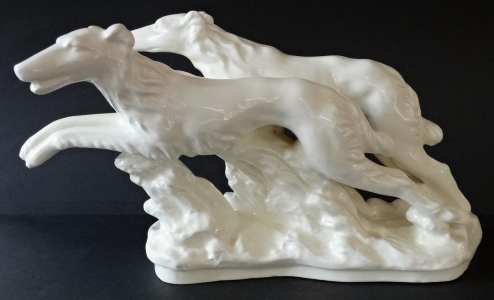 Sculpture of two running dogs skipping low scrub. Relief shaped pedestal at the front. Low arched oval plinth. Marked on the pedestal and on the side - K. Steif with date 1940. Below the manufacturer's mark. Horni Briza, Bohemia year 1940. Height 19.5 cm, width 37 cm.